Ah, spring break. It’s a time to take a week off from school and responsibilities, to hang out with friends and to travel, usually. What do you do if you don’t have any plans for travel? Or you can’t afford to go somewhere? There are many things you can do. While spring break is usually portrayed as a week of fun, you can also spend it working towards your future. 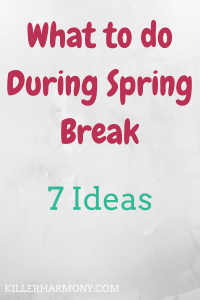 There are multiple ways to spend spring break that don’t cost a ton of money or require you to travel. 1. Look/Apply for Summer Jobs. If you plan to work over the summer, now is the time to start looking for those jobs. It can take awhile to get a response from companies, so you don’t want to wait until finals are over to start your applications. 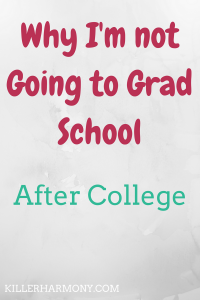 If you will be graduating from college, you should start thinking about what you will be doing after graduation. This could include a job. So take this free week to start your job search. If you are not graduating, or you will be going to graduate school, you can spend spring break planning out your classes. If you wait too long to enroll, you might not get your first choice schedule. It obviously won’t take all week to enroll in classes, but you can spend a few hours or a day planning out your schedule. Think of the classes you still need to take, what will be offered next semester, when you want to take those classes, etc. If you are like most college students, you are probably pretty tired. It doesn’t help that this past weekend, most of the United States moved the clocks forward an hour. We all lost some sleep this weekend, and spring break is the perfect time to get that sleep back. If you don’t have a your whole break planned out, spend an extra hour each morning getting some sleep. You shouldn’t sleep the day away, but your body will thank you for getting back on track. Sleep is also a nice way to pamper yourself. There are so many benefits to sleeping, and it can even help you forget about some of the stressful things you have going on, if only for a little while. I know, I sound like a nag. But, spending this week catching up on your work is going to make going back to school a breeze. Things come up, and we can easily forget about our homework for a day or two. Use your spring break to catch up, and who knows? Maybe you can get ahead? Homework is not the most fun thing to do over break, but if you get caught up or even ahead in some classes, you can save yourself a lot of stress later on. You won’t have to worry about staying up at all hours of the night to finish a paper. You can say yes to dinner with friends. It’s totally worth it. Trust me. 5. Spend Time on a Hobby. 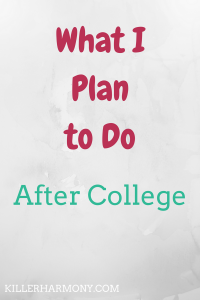 With classes, you don’t have a ton of time left over to do something fun. Use your extra free time to something you enjoy. Pick up a new (or old) hobby. Go to your local craft store and see what inspires you. Watch some YouTube videos on things that interest you. Start a blog. Check out that new Netflix show everyone is talking about. Do something that you wouldn’t normally have time to do. You will have fun, get to relax a little and you might even find a new activity that you want to pursue in the future! 6. Have a Spa Day. Do you have a day with no plans whatsoever? Turn it into a spa day! Break out the soaps, nail polishes and whatever else you want to use. You can make it into a whole day event. Blast your favorite songs, and just enjoy yourself. You have earned a day off. 7. Do Some Spring Cleaning. This will work better depending on where you end up over spring break, so this might not apply to everyone. If you will be either in your college dorm or apartment, or you are going home, get in the spirit of spring cleaning. Get rid of any trash or old stuff you no longer need. Break out the summer clothes. Make a few piles of stuff: trash, keep, donate, etc. This week is a great time to get organized and refresh before spring is in full gear. What are you doing for spring break? Let me know in the comments or on Twitter (@HannahHaefele)! 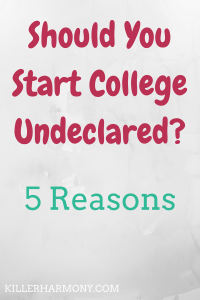 Author HannahPosted on March 7, 2017 March 5, 2017 Categories CollegeLeave a comment on Should You Start College Undeclared?